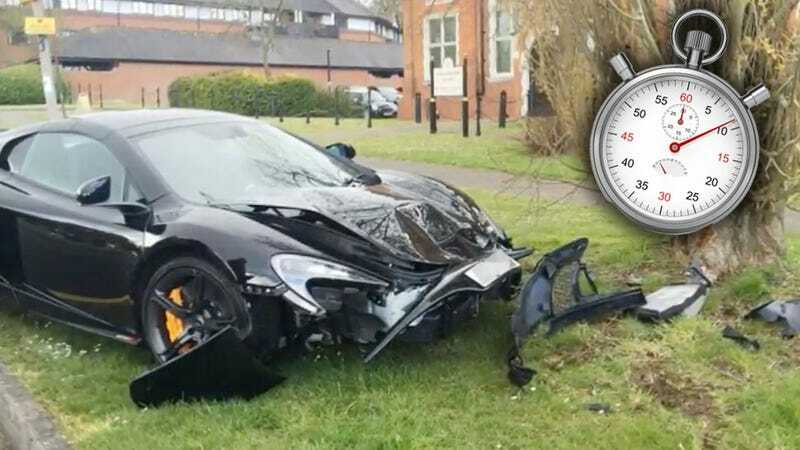 It takes a special sort of person to drive a McLaren 650S. As a supercar capable of hitting 100 mph in under six seconds, they won’t even sell you one unless you have two very specific things: about $300,000 and a functioning metabolism. One man in Essex, England with just these criteria bought one, and managed to crash it into a tree 10 minutes later. The pictures (pulled from this video of a bunch of stills) show what appears to be a pretty good nose-first whack into the tree, which pretty much spread the whole front bodywork of the car all over the grass around the tree. According to The Telegraph, neighbors report seeing the new owner celebrating with champagne as he took delivery of the car, and my guess is there was some sobbing with the rest of the champagne about 11 minutes later. Local Essex police are not sure who was driving the car when it crashed, and are asking for witnesses to the shadenfreude-packed event. This is hardly the first time someone has spent a crapload of money on an extremely powerful car, only to very quickly find that money doesn’t magically buy the skills to drive such a car, too. This gives me an idea, though, for a more responsible form of supercar sales: when someone buys a car with performance that would put it in the supercar class, they get the performance-inhibiting valet key to take it home with. They can get the real key a week later, where it will be placed in a box located at the end of an autocross course. The autocross course will be at their dealer, and if they knock over more than, say, two cones, the box remains locked and they have to come back next week to try again.